Added some feet for leveling and to get it off the steppers. Put together the MakerGear plastruder. 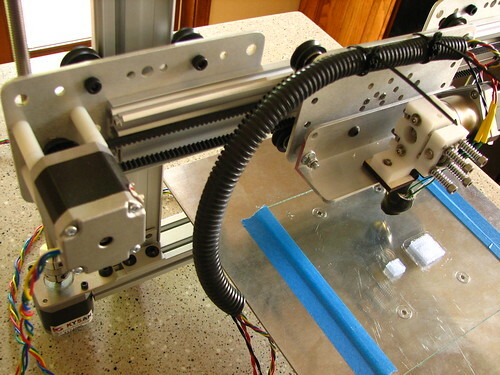 Mounted the plastruder with a piece of ALU angle extrusion. I'm going to move the mount and redo the belt attachment to see if I can clean things up. It's printing, or at least extruding plastic in recognizable shapes! Printed a 10x10x5mm 1/2 cube & tried a 20x20x20mm cube. There was a glitch that caused a Y axis shift about 4mm into the 20mm cube -- I'm not sure yet if it's hardware, firmware, or Gcode. Next up -- Install limit switches. Since this requires partial disassembly, I might add some holes for wire management at the same time. Is anybody familiar with extruder PID tuning? I'm using Marlin with the Makergear hotend configuration. Is the PID not working well? If you give some more description of the problem, I might be able to figure out some suggestions. Looks good so far with the prints though. I'm guessing that the Y-axis skipping is either a firmware issue (acceleration/feed too high, probably the former) or a mechanical issue (pulleys slipping or binding). I'm having a problem getting to a stable temperature with the M109 GCode. During the 30 second TEMP_RESIDENCY_TIME after reaching the target temperature, it keeps cycling more than 3 degrees over/under the target, and resetting the timer. 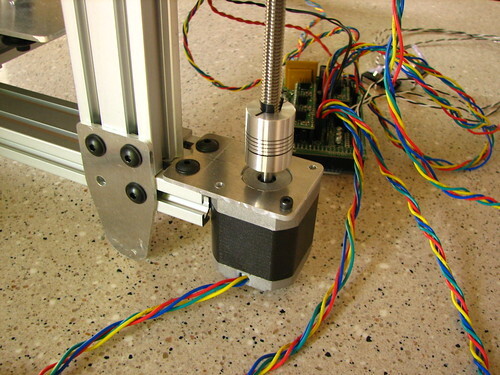 I've set Marlin up in Configuration.h, to use the Makergear hotend value set. The thermistor supplied with the hotend came with a beta value (4066), but I'm not sure if that needs to be plugged in somewhere. Try turning up kP a bit and see if that helps. if it gets more unstable, turn it back down and increase kD a tad. Just a quick note to mention that I was able to fix the glitch causing a Y axis shift by reducing the current on the Pololu stepper drivers. Curiously, increasing the current made it worse, and reducing the current eliminated the problem. That sounds like the stepper driver is overheating and doing a thermo shutdown. Tried printing the squirrel that JeromyBP printed on his ORD Bot (forum post). I've got some tweaking to do -- the top of the tail & the ears are pretty much a molten blob, but I'm pretty excited about getting it to print at all! You need to allow the layers to cool when using PLA, or you'll get drooping and blobbing on quick layers like you're seeing at the top of that print. A fan fixes this. I use a 120mm fan blowing across my print area, but others use 40-60mm fans attached to the X carriage blowing directly on the extruded plastic. Looks awesome especially for a first(?) print! If you're using slic3r for g-code generation, try setting the minimum time per layer to something between 10 and 16. Also, make sure cooling is enabled. If you're not using slic3r, you should be.